ModularAnalog™ is an Indian manufacturer of electronic music instruments and audio equipment. Founded in 2016, ModularAnalog™ is a young and dynamic company led by Artists and Engineers. Their products include Desktop and Modular Synths, Midi Devices, Effects Processors, Audio Patch Cables and electronic music equipment power units. 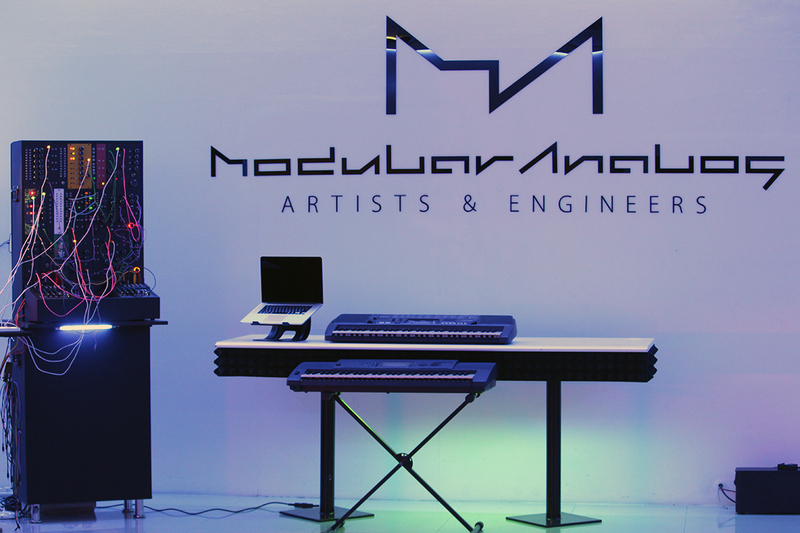 ModularAnalog™ is one of the first companies in India to venture into building and selling modular synths, making them a pioneer in this space. With a focus on the Indian electronic music community, ModularAnalog™’s goal is to make modular synths and innovative electronic music instruments available in the Indian market at affordable prices. MA is a company built on the foundation of music technology. Founded by a team of successful engineers and musicians, MA’s strength comes from possessing a team of developers that include electronic engineers who are also established electronic musicians, Software programmers who have studied music academically, product designers who are qualified sound engineers and sound designers, Live musicians who test the tonality and musicality of our products. MA is India’s first professional modular synth company with over 60 members who contribute tirelessly in developing and building the Modular Synth culture in India. What are your goals as a modular synth company in India ? One of our goals is to put India on the map when it comes to modular synth culture, with all due respect to the artists (including us) who use synths in their performances, thats not enough to get India synthing. What India needs is a revolution in its electronic music culture. We think affordable, easily available and simple to use modular synths put into the hands of every enthusiast and upcoming electronic musician is what can bring about this change and make India synth. We see a bright future because music made with a modular synth lends itself to quite a few genres and involves a different level of creativity from the musicians.Being modular synth artists ourselves, we know it and we have also heard some of the biggest international artists say “modular synths are very addictive”. We don’t just see India playing modular synths but based on India’s industrious and artistic cultural heritage we believe there’s gonna be a growing community of modular synth builders in India. Are you the only guys building modules in India ? Absolutely not, in fact we know there are quite a few people out there who are building modules, buying and using DIY kits who understand audio synthesis and dream of having their modules on a modular synth rack.We were one of them.It took us a tremendous effort, investment of time and money but more than that its taken us guts to go from bedroom electronic engineers to establishing a synth company of the level and maturity that we are today.We want to encourage India to build and use modular synths and believe that we have got the ball rolling. Do you work as a team and who handles what? MA is a company of 60 employees and our team is part of a bigger endeavour. There are 12 members that make up the core team, who are both Artists and Engineers. We run a very flat hierarchy where the roles and responsibilities are close to equal. Our work culture and professional ethic is quite unorthodox which is also a big reason for our quick success and productivity as a whole. Do you guys come from an engineering background? Absolutely! In fact we pride ourselves in being Engineers with musical talents and we have even surprised ourselves with our own entrepreneurial abilities. Your motivation behind starting the same? Difficult to pinpoint a single or even a couple of reasons behind our mission. Whether its been our dream to put India on the modular synth map or our love to create pure electronic music we cant really say.But what we can say is that our biggest motivation and drive is definitely our passion to do something new and innovative in the field of music! Tell us a little bit about your units and any upcoming projects? About our Units, well, we think seeing is believing and the best way to get a sense of our products is to watch some of our demo videos and listen to our sample tracks. But to answer your questions with words. Well, it’s Hard to describe our product other than calling it an Analog Audio Workstation. While it’s a modular synth, we like to think of it as one holistic musical instrument. As for the project we are working on, the biggest one on the board at the moment is our launch at the Palm Expo 2017 in Mumbai on June 1, 2 and 3rd. Another active project we are backing in a big way is the “Make India Synth” movement which we would love to get out there to get India synthing! In the near future. Our live gigs is something for everyone to look forward to. Its going to be nothing like anything seen before. Where and when can we expect to demo some of your units? Palm Expo 2017 is where we officially launch in public and in the market as India’s first modular synth company. You can then expect to also see us in our Artist Avatar pop up around cities and at events through the rest of the year! But anyone and everyone is welcome to visit our Studio in Mumbai and jam with us using India’s first modular synth! What kind of synthesis do these systems follow? Subtractive Analog Synthesis. But sometimes even we cant explain the synthesis and unique sounds we generate from our modulars! Your favourite units and developers apart from your own work? Are any of your units replicas? What are you guys looking to do different with your work? As of now we are 100% analog. From our smallest VCO to our very large 16 track modular synth mixer, everything is built on analog circuits. Our approach to building our modules is completely based on ours needs as electronic musicians and we strongly believe something unique can always come out of necessity. In fact it would be difficult for any person familiar with modular synths to be able to recognise or compare our modules to anything else they have seen before. That’s how unique we are! We’re excited to see a young and dynamic team of young engineers and artists based out of India building Modular synths. With extremely unique and well thought out modules that will most definitely #MakeIndiaSynth again. Most of their modules are really unique, we’re really looking forward to hearing them when we are at the Palm Expo 2017 in Mumbai on June 1, 2 and 3rd. MINI GATE THRU– Quick and simple solution to multiply gates, that’s what this module does. Simply give it a gate/clock and it will give you a 4 beat clock or gate depends on how you want to use it. A handy module to have when you start running out of CV gate triggers on your Arturia BeatStep Pro. 12X12 POLYPHONIC VCO-The 12×12 polyphonic VCO is a true ModularAnalog innovation with nothing like it in the synth world. 100% analog the 12 ins are free keys that can be tuned any frequency or note in a 5-octave range. Like the 12×12 the notes are triggered with CV. The 12 voice polyphony allows multiple notes to be played simultaneously and with different CV gates. The synth can run chords, arps, single notes as well as step sequences. Each note has a CV out which can be used to trigger other notes in the same or external modules, this gives the module tremendous extensibility and playability. 8X4 STEP GATE SEQUENCER -A modular synth rack without a step sequencer? Never heard of that! The ModularAnalog synth patches typically have a few of these always racked up. The 8×4 step sequencer is another innovative module that use LED light pins to write and trigger its sequences. Coupled with the 8x step gate sequencer mixer, this module becomes a powerful tool on the musician’s rack. ADSR– Attack, Decay, Sustain and Release… ADSR is all about sound shaping from pads to sine wave kick drums, from pulsing basses to atmospheric sounds. BASS DRONE– The Bass Drone is a 4-note bass VCO, which can be tuned through 4 low octaves and triggered via CV gates from any external step sequencer. 8 STEP GATE SEQUENCER MIXER– 8 step sequences are sometime not enough to create complex patterns. That’s where the 8-step sequencer mixer comes in. This module takes 2 sets of 8 steps sequences and mixes them into a single 16 step sequence. With clock, gate and reset sync enabled this module works perfectly with the MA 8×4 step gate sequencer. 8X CLOCK THRU– A gate clock multiplier that takes a single clock or gate in from a device like the Arturia BeatStep Pro and multiplies it to 8 outputs that send CV gate clocks to external modules. Delay– Simple delay based on a classic guitar pedal delay module. It works its wonders on the mini arp and 8 step monophonic sequencer giving it deep melodic quality. DUAL DELAY– Simple delay based on a classic guitar pedal delay module. It works its wonders on the mini arp and 8 step monophonic sequencer giving it deep melodic quality. This module has a dual input and output independent of each other. MINI ARP– 4 tunable free keys that can be triggered with external clocks and gates allowing you to write 3 or 4 step arpegiations for quick melody fills and background leads. DUAL VCA– Built to accompany the ADSR module, the Dual VCA amplifies and shapes the audio output base don the ADSR CV. The module can also be used as a simple amplifier or driven with an LFO to modulate audio passing through it. 4 CHANNEL MIXER– The ModularAnalog 4 channel mixer takes 4 inputs with independent level controls gives a mix output with a master level control. Ideally used for grouping module outputs or even mixing VCO’s for unique wave forms, the 4-channel mixer is always in use. KICK DRUM– Be it a punchy kick or a flat minimal techno sound, a kick drives the tempo of the track and that goes for electronic music made on modular synths as well. The ModularAnalog kick drum module is based on Craig Anderton’s 1983 design with a little twist and spice. MAD HATTER– This ModularAnalog trick knocks out peculiar hi hats, chokes, sharp snares and chimes depending on how you set it up. Controlled with a set of switches and a built in LFO the mad hatter is a bit of a hat trick from the MA engineers. 4 TONE PERCUSSION– his module is only the first of many to come from ModularAnalog labs. Creating a woody tom-ish sound that can be shifted through 4 tones, this module is a good accompaniment for your kick drums. HI HAT/CHOKE– This module is a simpler verison of the Mad Hatter that gives you 3 tones of hi-hats and a simple LFO to mix it up a bit. LASER TONE– Call it a laser tone or a zapper, this little trick adds a real retro techno personality to your track. DUAL 3 WAVE VCO– Another Classic VCO design based on 3 waves (Square, Triangle and Sine), this free oscillator can be used as a drone or run through an ADSR to create basslines, kicks and pads. Each wave form gives the output a distinct sound. SAMPLE & LOOP– The module allows you to sample audio on the fly and play it back in sync with the rest of the modules. Supports a line in recording feature that can take audio form your phone, a mic or even a module on the rack and play it back using a gate clock. The pitch control knob allows you to change the sound and tempo of the sample which makes interesting effects for percussive sound and especially voice and vocal samples. Lookout for the more powerful desktop version of this module which take sample and looping on modular synths to a whole new level. MONOPHONIC 8 STEP SEQUENCER– A simple yet powerful module, a true retro style step sequencer with free key tuning knobs and flick switches. Create bass lines, melodic arpeggiations and leads. CHORD GATER– The Chord Gater is just one of them we decided to release early on. The Chord Gater takes a clock in that gives out 4 CV gates that can be connected to the MA Chorder module. It also takes a gate in which is used to change the progression of the gates. A rather tricky module to describe and use but really nifty. You have to watch the video demo to get a real sense of what it can do. 3X DUAL WAVE LFO– ModularAnalog’s 3x dual wave LFO contains 3 individual dual wave low frequency oscillators, that can be used with our VCA. The LFO brings new dynamics to your sound and helps you shape it. The MA LFO has a wide frequency range so you can achieve sub-base and base sounds.